A: The cost of NATURE STONE® Brand Flooring can depend on many variablessuch as the current condition and required preparation of your existing concrete, the type of stone that you choose, the required stone-to-epoxy mix ratio, and the amount of stone material (thickness) needed to correct uneven concrete areas. The access to the flooring area, NATURE STONE® Brand Flooring patterns and designs, and wrapping of faces or steps are also factors that can affect the pricing to properly and professionally install your floor. To provide an accurate estimate it is critical to physically inspect the area. Authentic NATURE STONE® Brand Flooring estimates are free and at no obligation and there is no charge for a site inspection or consultation. Purchasing long-lasting NATURE STONE® Brand Flooring is not like buying a yard of carpet or tile off of a shelf. An on-site visit can uncover many opportunities to maximize the appearance and longevity of your NATURE STONE® Brand Flooring as well as identify ways to solve recurring floor covering issues. A: Have you ever made Rice Krispies® Treats? What would happen if you reduced the amount of marshmallows and increased the amount of cereal to stretch the batch? The answer is simple; the dessert would not bond together properly and simply fall apart. 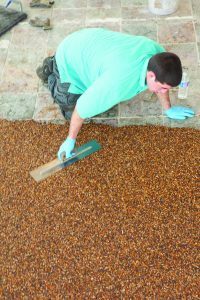 Many competitors try to cut costs by doing the exact same thing…reducing the amount of epoxy (usually a generic epoxy) and stretching the batch by adding extra stones for more coverage. This drastically reduces material costs at the expense of product integrity and is a sure recipe for disaster. The cost of a stone and epoxy floor, and the strength and performance of the floor are in direct relationship to the amount and quality of the epoxy used. The epoxy holds the floor together...not the stone. With Authentic NATURE STONE® Brand Flooring you always get the proper epoxy-to-stone mix ratio for a strong, long-lasting and beautiful floor. A: We offer specially-formulated cleaning products for outdoor, garage and interior applications of Authentic NATURE STONE® Brand Flooring. Authentic NATURE STONE® Brand Flooring also maintains a fully staffed, professional customer service department for all your cleaning and maintenance needs. A: We get that question a lot. And there’s a good answer. We have found over the years that homeowners usually prefer it that way. By having all decision-makers present it actually helps simply the education and buying process for the homeowners. What’s important for one person (say, the technical specifications and excellent “R” Value) may not be important to the other. They may be more interested in the color or border and graphic possibilities. With everyone together, all questions can be addressed on the spot. Further, the quicker the homeowners get all the information they need, the sooner they can make a decision --- and start enjoying their beautiful NATURE STONE® Brand Flooring. A: Authentic NATURE STONE® Brand Flooring is the only stone and epoxy company to offer an unconditional warranty on our materials cracking, delaminating and losing their beautiful gloss for 10 full years. Unlike some competitors, Authentic NATURE STONE® Brand Flooring's warranty is not a hidden service contract, nor contains hidden disclaimers and no surprises. See our warranty.